As consumers grow more aware of what they’re eating, local farmers markets are experiencing exponential growth. Take a tour of local markets and untangle terms like “organically” and “naturally” grown. Many great things come together at public markets and apparently we hunger for all of them – the fresh homegrown food, the reclaimed downtown identity, the connection with neighbors, entrepreneurs and farmers. It turns out we like being together – a lot. Local markets have grown exponentially in our region, to the delight of bean growers and bean counters alike. And while larger markets incorporate many extras, like live music, the foundation for all is the farmer. There’s just something good about meeting face-to-face with the human who grew your tomato. That tomato is no fruit fraud, either; it has actual tomato flavor and nutrients. Here’s a closer look at some local markets, their financial impact and the hard-working folks who keep them humming. We’ll also visit a local farm and untangle terms like “organically” or “naturally” grown. 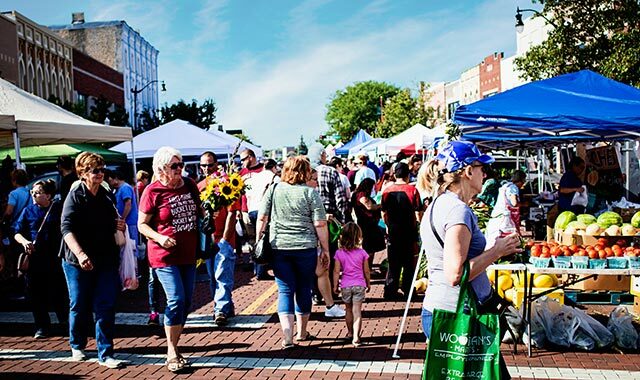 “If you’d have told me in 2010 that we’d have more than 110,000 visitors per year to Rockford City Market by 2017, I would not have believed you,” says Cathy McDermott, executive director of Rock River Development Partnership (RRDP), the nonprofit keeper of this market. On good-weather Friday nights, about 6,000 people trek downtown to shop, eat and play together. McDermott has worked with the market since it opened in 2010 and assumed full responsibility for it in 2012. She hasn’t had much time to catch her breath since, but she has made sure the market stays true to its original mission: connecting vendors with customers. That’s harder than it sounds. All products must originate from within a 150-mile radius. By giving entrepreneurs a low-overhead way to connect with customers – farmer booths cost $10 per week and others from $22 to $35 – they learn whether or not their products have traction. Off the top of her head, McDermott ticks off some success stories launched at Rockford City Market. Bella Luna Bakery now has a storefront at 308 W. State St. inside Stewart Square; Candle Crest, maker of hand-poured soy candles, now has a location at 1418 20th St.; Woodfire Brick Oven Pizza now has a thriving location at 408 E. State St.; Kate’s Pie Shop Café & Records now has a storefront at 6685 E. State St.; The Canine Crunchery, maker of dog treats, now has a store at 1888 Daimler Road. The Sweetery has a thriving custom cake business and Hermes Popcorn is in demand at all kinds of events today. Much as she enjoys thinking about the big-picture impact of Rockford City Market, it’s the attention to detail that makes a market successful, she says. McDermott relies on her Friday night staff of 12, community partners who develop activities and her trusty checklists to ensure a smooth event week after week. She also coordinates with the Rockford Police Department and hires private security; she’s seen remarkably few problems over the years. “People feel very safe at the market because they are safe,” she says. The market pays for its own overhead by re-selling beverages and by collecting vendor fees and sponsorships. Rockford City Market hit a milestone when a permanent pavilion was constructed on Water Street in 2015, the first year attendance broke 100,000. Now another milestone is within sight. Next year will see the opening of Indoor Rockford City Market just east of the pavilion. Rockford City Market LLC owns the building, which is currently being renovated. The Indoor Market will feature permanent food vendors, a community kitchen that can be rented out and a market hall for community events like craft, art and vintage fairs. It will help farmers to extend their selling season and boost downtown traffic in cold-weather months. “And it will have real bathrooms instead of Port-O-Lets!” jokes McDermott. No matter how big City Market gets, the farm-fresh products will remain central to its foundation, she says. Produce must be locally grown; the only exceptions are items that don’t grow in our region. Farm products are central to all local markets. Not all fresh produce is equal, however. It’s wise to know your way around some important terms. The section below on Farm Product Terms Defined may help. The Beloit Farmers Market is 51 years old and welcomes nearly 10,000 visitors each Saturday morning. This year it registered 113 vendors and 200 more are on a waiting list. Total sales in 2017 topped $580,000 and the Downtown Beloit Association estimates a local economic impact of about $2.1 million. One in every 10 visitors lives in Madison, Milwaukee, Chicago or some other far-flung place. Like Rockford City Market, the Beloit market benefits from consistent management. Crystal Cribbs, promotions coordinator at the Downtown Beloit Association, has nurtured the market for the past 10 years – a decade of explosive growth. Vendors pay $150 for the season and get first dibs on a spot the following year. “Consistency of vendors from year to year is one of our strengths,” she says. Visitors enjoy seeing familiar vendors like the fresh-faced Van Laars Fruit Farm youths who patiently explain to customers the flavor profiles of various heirloom tomato and apple varieties. Likewise, visitors look for the soft-spoken nuns from St. Roger Abbey, who sell exquisite French-style baked goods every year. Growth brings challenges. Vendors were clamoring for particular positions a few years ago and keeping them all happy became too complicated. Cribbs came up with a solution. Other new rules have become necessary, too, like banning pet visitors. “People weren’t just bringing leashed dogs,” Cribbs says. “We also saw pet cats, birds, chickens – even a pet pig.” The last straw was a dog who “watered” a vendor’s display. Cribbs attends the market each Saturday morning, looking for ways to improve the visitor experience. She addresses any problems in a weekly newsletter to vendors and stays abreast of legal changes that may impact them. Cribbs schedules live music for first and third Saturdays and plans to introduce cooking demonstrations other weeks. Saturdays begin very early for farmers who harvest their produce before traveling to the Beloit Farmers Market. The corn was piled high in the back of her O’Leary-Gunn Farms pickup truck. Food doesn’t get much fresher than that. In 2015, the Beloit Farmers Market began requiring new vendors to sell only locally grown produce. Exceptions are foods that don’t grow here or items shipped in to bridge the season before local crops ripen. Along with growing demand for fresh, locally grown food, many visitors want food with minimal or no applied chemicals. With 113 vendors, you might think the Beloit Farmers Market is loaded with organic produce. But just five vendors sell USDA-certified organically grown produce (or NOP, which stands for National Organic Program). Growers who do advertise organic status must submit proof of certification along with their vendor application each year. The term “organic” can’t be used by growers unless they’re certified by the USDA’s program. Cribbs has suggested to some farmers that they look into the Certified Naturally Grown (CNG) program. It’s similar to the USDA’s organic program but is administered by a private nonprofit group. It relies on peer reviews rather than third-party inspectors to monitor farm practices and isn’t as costly. Both the NOP and CNG programs began in 2002 to help consumers verify who’s farming without the use of synthetic herbicides, pesticides, fertilizers or genetically modified organisms. Every CNG farmer has a profile on the CNG website, which enables a customer to verify a market vendor’s participation. Both organic and CNG farmers are happy to provide proof of certification; these are proud achievements. While strolling farmers markets, you may also see terms like “No Spray,” “Chemical-free” or “Natural.” While they probably describe the product accurately, there’s no way for market organizers or customers to know for sure. “We just have to trust our vendors to be honest,” says Cribbs. Paracre Farms, owned by Ken and Luana Parr of Monroe, Wis., sells fresh and preserved produce in Beloit. Son Joseph Parr helps out. When snow is falling in February, Philip Anderson is honing his plan for the next growing season. He juggles more than 100 varieties of produce on three properties, including a family farm owned by his parents on Paulson Road in Caledonia, Ill. Figuring out the staggered harvest times for 20 types of lettuce or 12 heirloom tomato varieties is pretty mind boggling, but he tries to make sure there’ll be plenty to sell every week of the selling season and enough workers to pick it at a moment’s notice. Anderson Organics is among the five vendors registered at Beloit Farmers Market as USDA-certified organic. It’s a hard-won designation, but one in which the Anderson family takes pride. That “certain way of farming” involves nurturing the natural fertility of soil rather than focusing on plants alone. While indoor hydroponic mass production allows us to buy fresh produce year-round, and doesn’t require the use of pesticides or insecticides, there’s a flavor and nutritional trade-off, says Anderson. There’s a debate about whether hydroponic produce should qualify as organic. The USDA monitors Anderson’s farm via third-party inspections for which he is billed. Inspectors take soil and water samples, track the origin of every seed and restrict additives to a list of natural substances approved by their research board. Reams of paperwork are required. Every batch of every crop is numbered so it can be traced. Mostly, the USDA wants him to have a plan and stick to it, which Anderson views as a good thing. But he also knows that organic farming is a risky business. “It’s not whether disease will strike a crop, but when and which one,” he says. Compared with Salinas, Calif., “the salad bowl of the U.S.,” weather here is erratic and harsh. This year’s 13 inches of June rainfall wiped out most of Anderson’s broccoli rabe crop, a customer favorite. There’s no predicting or preventing a calamity like this, but there are things he can do to make his plants naturally stronger, such as grafting them and enriching soil with micronutrients that bolster immunity. Anderson isn’t trying to compete with the national food supply system. He knows only about 1 percent of the produce Americans consume comes from a local market. For him, it’s about growing the best food possible and financially supporting his family members, who value their rural lifestyle and share it with many friends. He and wife Kelli served as global missionaries for many years and now have two young sons. They appreciate the impact nutritious food has on peoples’ lives. “We like the idea of ministering to the whole person, with good food for the body and the spirit,” he says. Along with selling at farmers markets, Anderson Organics sells to Rockford restaurants Five Forks, Abreo, Social and Prairie Street Brewhouse, as well as to Choices Natural Market. It also offers a Community-Supported Agriculture program (CSA) in which consumers pay an upfront subscription for a weekly box of fresh-picked produce. “The CSA is the best value for customers and the most stable income model for growers,” Anderson says. After all, weather impacts market crowd size as much as crop yield. After Labor Day, 3:30-7:30 p.m.
and Tuesdays noon-3 p.m. in municipal parking lot between Douglas and Exchange streets. All products sold as “organic” must meet the USDA National Organic Program production and handling standards. Certification is mandatory for farmers selling more than $5,000 of organic products per year, and includes annual submission of an organic system plan and inspection of farm fields and processing facilities. CNG products are certified by an independent nonprofit organization (not USDA) as having been produced in approximate similar accordance with organic standards. This program involves less paperwork and cost. Standard agricultural practices. Can (but does not necessarily) include use of pesticides, synthetic fertilizers, “mono-cropping,” antibiotics, hormones and other chemicals as well as Genetically Modified Organisms (GMOs). Plants and animals whose genetic makeup has been altered to exhibit traits that they wouldn’t normally have, like longer shelf life or different colors. Also called farmers’ varieties, or traditional varieties, these have been developed by farmers though years of cultivation, selection and seed saving, and passed down through generations. Generally speaking, they’ve existed at least 50 years. Contains no animal product like meat, eggs, dairy, gelatin or honey. If an animal product is labeled “humane,” it implies that the animals were treated with compassion. “Certified humane” means they were allowed to engage in their natural behaviors; were raised with sufficient spaces where they are able to lie down; had shelter and gentle handling to limit stress; and were given ample fresh water and a healthy diet without adding antibiotics or hormones. Not all “humane” claims are regulated. Free-roaming and pastured imply that a product comes from an animal that was raised unconfined and free to roam. Free-range claims on beef and eggs are unregulated, but USDA requires that poultry have access to the outdoors for an undetermined period each day. The diet of grass-fed animals consists of freshly grazed pasture during the growing season and stored grasses during the winter months or drought conditions. Grass feeding is used with cattle, sheep, goats and bison. This entry was posted on Friday, August 17th, 2018 at 12:00 pm	and is filed under Features, Top Posts. You can follow any responses to this entry through the RSS 2.0 feed. Both comments and pings are currently closed.